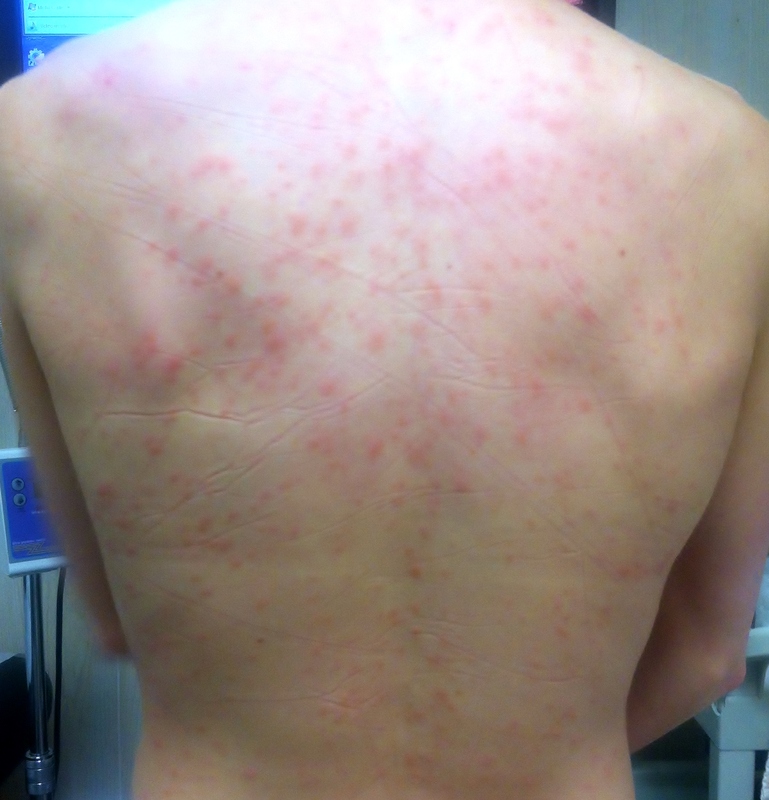 Home » Skin Disorder » Can Acupuncture Successfully Treat Skin Hives? Hives (urticaria) are swollen and red, bumps, patches or welts on the skin that appear suddenly. Itching is the most common symptom associated with hives, although some people report that hives cause a stinging or burning sensation. Hives can occur anywhere on the body including the hands, face, lips, tongue, throat, or ears. A sign that the whole body is experiencing a hypersensitivity reaction, a hives outbreak can occur due to a wide array of stimuli. While intolerance to certain foods, additives, intense emotions, sunlight exposure, and medications can all cause hives, in 70-75 percent of outbreaks the exact cause of hives remains unknown. Whether lasting for just a few minutes, a few hours or persisting for several weeks, hives are rarely a medical emergency. However, in some cases they are the first sign of a strong allergic reaction to something and can be accompanied by shock or difficulty breathing, which can be life threatening. About 20 percent of people will experience hives (urticaria) at some point in their lives. While standard treatment for acute cases of hives involves antihistamines or a corticosteroid drug to relieve symptoms, many people are turning to acupuncture and East Asian medicine to address underlying imbalances that cause this condition and help stop recurrent outbreaks. In East Asian medicine, an outbreak of hives is described as wind invading the skin and the meridians, causing itching and swelling. When the eruptions are red, it is an indication that wind and heat are involved. When the eruptions are a pale pink or white, it is likely that the diagnosis will be wind-cold invading the skin. How the condition is diagnosed will determine what acupuncture points are used, what herbal medicines are prescribed and what lifestyle/dietary recommendations are made. A study published in the Internet Journal of Dermatology examined the efficacy of acupuncture in the treatment of chronic hives (urticaria). The results showed that acupuncture was able to reduce both episode rate and episode duration of urticaria by as much as 25 percent. After three weeks the majority of the acupuncture treated patients experienced partial remission of their symptoms. The researchers also noted that the greatest improvements were seen in the third week of treatments and that the efficacy of acupuncture seemed to increase with each treatment. In Tao of medicine, each patient is individual, and thoroughly assessed of their energy by a skilled practitioner which is the best judgement of whether treatment may be beneficial. we here make successes in both acute and chronic cases with this close and thorough Eastern diagnostic procedures(most of cases, within 2-4 visits, patients notice the significant change.) and there have been many good herbal formulas which have been continuously used for this kinds of symptoms over thousands years, still as effective. However, if you wanted to establish whether acupuncture treatment was a good option for yourself or someone on whose behalf you are asking, then a brief face to face assessment by a experienced Acupuncturist is your best way.